Four years after selling print-shop Uniprint to Russians and exiting the business, Andrus Reinsoo launches unique Canon digiprinter to fill European niche for small print runs. A subtenant to Tallinn Book Printers, DiPri says it may print for client just one copy of a book at short notice. Meanwhile, the optimal print run would be up to 300 copies. «Earlier, at the helm of Uniprint, digital printing felt like a hobby of sorts, but now I stand convinced that my former business is the one going down,» said Mr Reinsoo. Today’s digital technology provided quality equal to offset print and is helpful at the Estonia market of opposing interests while print runs are small. 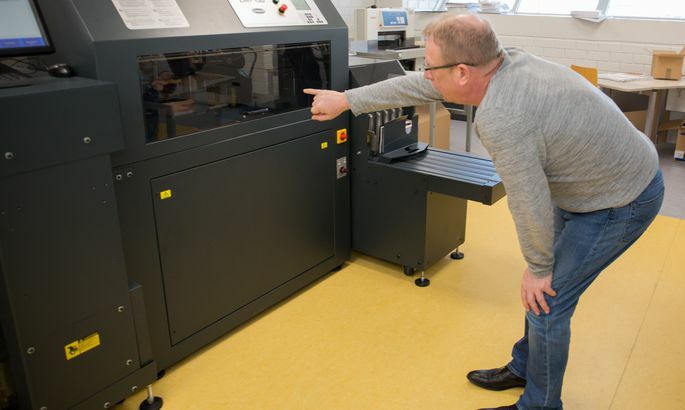 The ten metre production line costing close to €500,000 consists of a web-based Canon printer, a glue binder for books, and an automatic cutter. Under the very eyes of your correspondent, it only took a minute from pressing the button as a book by Tõnu Õnnepalu «Piiririik» came out – ready for sale. «With our help, aspiring writers may try their hand with small print runs, and large publishing houses can order extra print runs if something sells out,» Mr Reinsoo explained his business idea. As assured by DiPri clients, hundred to two hundred books gat ready so fast that they get what they ordered by next day but one. Koolibri, responsible for bulk of school textbooks in Estonia, has no use for the digital print house, citing their large print runs. «At DiPri, it makes sense to print till 300 copies; above that, the prices will move in favour of ordinary print-shops,» said Koolibri marketing manager Katrin Kliimask. «But if we go 100 copies missing on some textbook, in August, it helps.» Meanwhile, they do think there is an outlook with filling e-store orders. Tallinn Book Printers, a veteran print-shop in Estonia, took DiPri in as for them it is no competitor. They think the guest will make ends meet at print runs of at least 600 copies. While widely used in the USA, digital printing technology used by Mr Reinsoo may be unique for Europe as printing both sides of pages at once. He said the closest compete solution is to be found in the Norwegian parliament, while it has no trimmer. «So it may be claimed that the total solution we sold to DiPri is unique in Europe,» added Mr Kuusk. DiPri print-shop employs a staff of five, two of which operate the production line. In 2012, Andrus and Sirje Reinsoo sold their print-shops Uniprint and Unipress to a leading North-West Russian print shop OOO Tipografichesk, Deviz. Uniprint became loss-making in 2009 when, after two years of negotiations, Oliver Kruuda opted out of purchasing it at the last moment. The financial results were pulled down by large emphasis on Russian export which shrunk by almost a half due to economic crisis. Also, the Reinsoos pointed towards insufficient investments while they were waiting for the new owner.